The man was transferred to Beaumont Hospital by the coast guard helicopter. A MAN IS in a serious condition in hospital after falling off rocks while shore fishing at Balscadden on Howth Head in Dublin..
It’s understood that the man, aged in his 30s, lost his balance while fishing with a friend. It’s believed that he fell 10 – 12 metres. It happened at around 4pm. 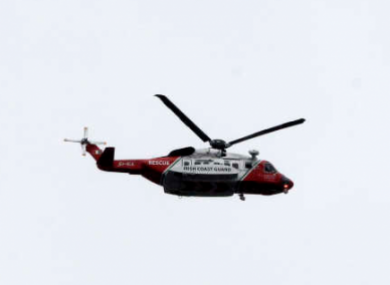 The Irish Coast Guard unit were called and had a medic on scene on arrival, the coast guard helicopter Rescue 116 then transferred the man to Beaumont Hospital. A crew from Howth Coast Guard along with the assistance of local Gardai secured the landing site and assisted with the transfer of the casualty to a waiting ambulance. While the Howth Coast Guard crew were assisting in the rescue they were also tasked to another rescue on Howth Head. Rescuers used a rope during the second rescue on Howth Head. Source: Howth Coast Guard. A tourist had become trapped half way up a 40 metre cliff at Whitewater brook near the Baily lighthouse. A rope cliff rescue was lanched and a rescue climber made their way down to the tourist who was unable to move from the steep cliff face. He was secured and brought to safety by the team, no further medical care was required. The man involved in the first incident believed to be in a serious condition in hospital. Email “Man in his 30s in serious condition after falling from rocks while shore fishing”. Feedback on “Man in his 30s in serious condition after falling from rocks while shore fishing”.